Water Colour painting by Claude Buckle showing a River Scene in the Pyrenees St Jean Pied de Port. 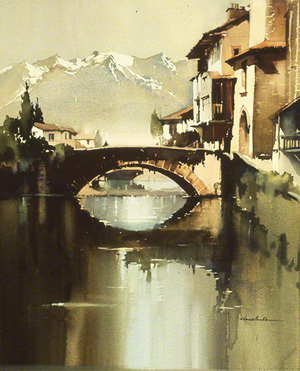 Claude Buckle captures the magnificence of the Pyrenees Mountains and river in this water colour picture. The location is unfortunately unknown but maybe recognisable to someone. Almost certainly drawn from the north side of the Pyrenees (in France) near a crossing point. Buckle made many excursions to Spain and France seeking material for his paintings. This is the only one where the Pyrenees Mountains are shown. Created in 1969.